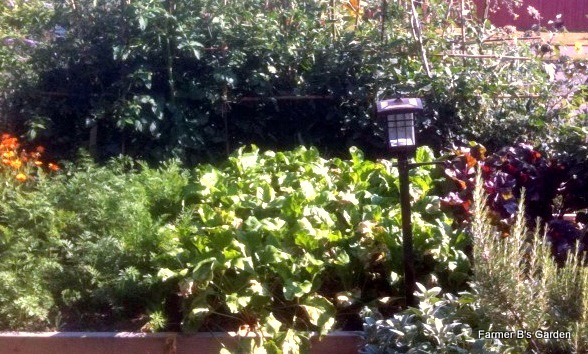 My mind wanders as I take a break in the vegetable patch. I am stuck trying to finish music for 3Seasons. The herb box contains flowering chives and thick sage leaves bring me outside where waving neighbors bicycle along saying that they love the garden. I feel the hesitant Seattle sun mixed with rain sprinkle an encouraging nod towards me tending the vegetable patch. My mind works through sound bytes and starts to weave sonic textures as I weed and prune, transplant and mulch, water and taste. Tending edibles finds a parallel with composing music. Both take time, patience and the willingness to let go and be surprised. Plants have their own ways of growing. By paying attention to the parsley, sage, rosemary and chives, my time as a composer is renewed where I can return to composing music refreshed and confident.